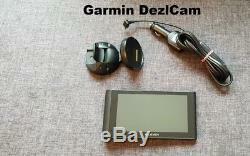 Garmin dezlCam HGV / Truck / Camper sat nav. Used sat nav in perfect condition. Lifetime Full Europe map for TRUCK - 45 countries (June 2018). Full set with memory card, car charger and holder. The item "Garmin dezlCam TRUCK sat nav with DashCam / Lifetime Maps 2019 / Traffic" is in sale since Monday, June 18, 2018. This item is in the category "Vehicle Parts & Accessories\GPS, Audio & In-Car Technology\GPS & Sat Nav\GPS Systems". The seller is "anetajackowska" and is located in Newry. This item can be shipped worldwide.